In the year or so since the 2013 International CES, two speaker demos in particular have haunted my memory as truly moving, ear-opening musical experiences. One was Wisdom Audio's behemoth LS4, a wall-mounted planar magnetic line array tipping the scales at 550 pounds and measuring 6.75 feet tall. The other? 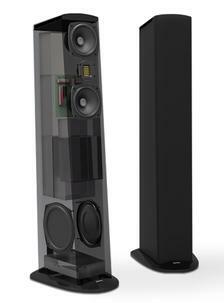 GoldenEar Technology's dainty, 30-pound Triton Seven, the littlest sibling in the company's Triton tower lineup. Both moved me in a way that a truly world-class speaker should. Both drew me in with startling detail, wonderful dynamics, and gorgeous soundstage delivery ... and I'm pretty sure I'm on record saying virtually exactly that somewhere in cyberspace at the time. What I didn't put together then - or, if I did, it has slipped my mind since - is the fact that the two loudspeakers that moved me most deeply in the hallowed halls of the Venetian Resort-Hotel-Casino last year differ in price by $78,600 (and two pennies, if you're counting) per pair. Of course, I don't mean to entirely equate the $40,000 LS4 with the $699.99 Triton Seven in every respect. Each has its distinct target audience and its own ideal listening space, and the former is capable of delivering sound pressure levels that'll rip your face clean off your skull in a pretty sizeable room, whereas the Triton Seven is a more sensible solution for small- to mid-sized spaces. The point of all this is that, if I can't help but compare a $700 speaker to a $40,000 one, I think it's safe to say that GoldenEar Technology founder and president Sandy Gross has attained his stated goal of bringing high-end performance down to prices that virtually any music lover can afford. The Triton Seven, of course, isn't the first speaker in GoldenEar's Triton tower speaker lineup. It follows the renowned Triton Two and Triton Three but, unlike previous Tritons (as well as the upcoming Triton One), the Seven is an entirely passive loudspeaker without powered subs. Instead, each cabinet relies on two side-firing eight-inch planar passive radiators to provide bass down to an impressive 29Hz, along with two 5.25-inch cast-basket mid/bass drivers and one of GoldenEar's High-Velocity Folded Ribbon tweeters (a variation on Oskar Heil's Air Motion Transformer. The latter, of course, is what gives the Triton Seven its distinctive, sparkling, distortion-free sound and is largely responsible for the fact that its voice is remarkably similar to that of previous (and upcoming) GoldenEar efforts. However, to focus purely on the folded tweeter would be to overlook so much of what makes this a truly incredible-sounding speaker from top to bottom. Click on over to Page 2 for the High Points, Low Points, Competition and Comparison and Conclusion . . .